With his hand-picked attorney general’s help, Trump is obstructing every investigation into his corruption—including the release of Mueller’s full findings. What is he hiding? 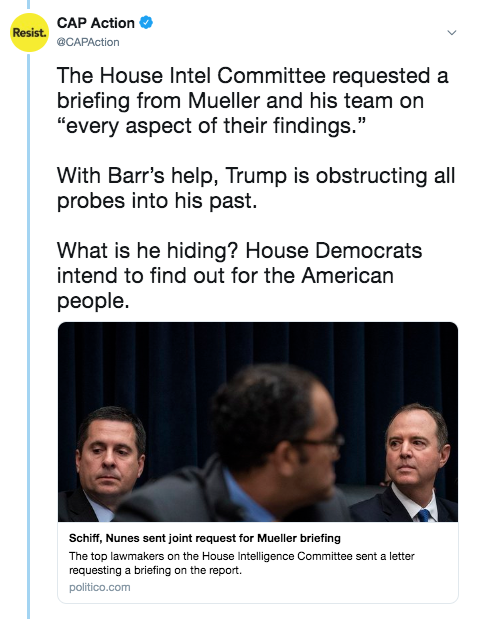 House Democrats are determined to find out for the American people. We have a right to know just how deep Trump’s corruption goes. Share this tweet thread to demand answers. TRUMP’S FINANCES: The House Oversight Committee subpoenaed ten years of Trump’s financial information from his former accounting firm. TRUMP’S FOREIGN DEALS: The House Intelligence and Financial Services committees subpoenaed Deutsche Bank and other financial institutions for Trump’s financial records. Deutsche Bank’s mysterious relationship with Trump is a key focus of congressional investigations. TRUMP’S TAX RETURNS: Every president since Nixon has released their tax returns—something Trump has repeatedly reneged on his promise to do. That’s why the House Ways and Means Committee is demanding that the IRS release Trump’s returns. It’s more clear than ever that we can’t rely on Barr or Republicans in government for answers. Watch this clip to understand why.